Malaysia Flying Disc Association is committed towards the mission of sending three national teams to represent the country at the 2019 World Flying Disc Federation Asia Oceanic Ultimate & Guts Championships in Shanghai. 60 top athletes from around the country have been identified via selection processes to form the Men’s, Women’s and Mixed teams. We believe the teams have what it takes to put Malaysia on the regional and global ultimate map. Being a relatively young and non-core sport in Malaysia, the biggest hurdle for us to make it to Shanghai are the financial expenses. The flights, accommodations, tournament participation fee and flights are some of the biggest cost to our national atheletes. 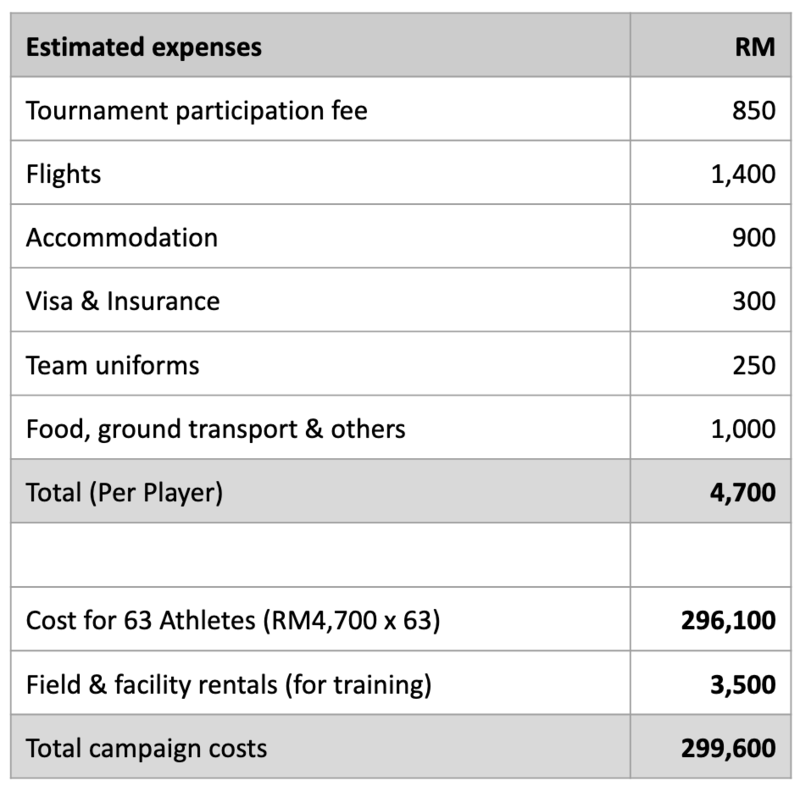 A player would incur an estimated RM 4,700 of expenses, with the entire campaign totalling up close to RM 300,000 across 60 players. Each player are working on their individual fundraising through various channels. But with your contribution, the athletes hope that it would help to ease these financial barriers, so that they are able focus more on training and represent Malaysia knowing that they will do everything they can to play their best in the upcoming AOUGC tournament. Our fundraising goal is RM30,000 which we hope to at least cover the cost of accommodation for our athletes first. We appreciate every ringgit contributed as the saying goes a little goes a long way. A breakdown of the expenses can be seen in the section at the bottom of this page. Help make our journey to Shanghai a reality by supporting this campaign! Ultimate Frisbee is a non-contact team sport played with a flying disc (frisbee). Points are scored by passing the disc to a teammate in the opposing end zone. Other basic rules are that players must not take steps while holding the disc, and interceptions, incomplete passes, and passes out of bounds are turnovers. Ultimate has resisted empowering any referee with rule enforcement. Instead it relies on the sportsmanship of players and invokes "Spirit of the Game" to maintain fair play. Players call their own fouls, and dispute a foul only when they genuinely believe it did not occur. Hence, the sport can be enjoyed across all genders, which is unlike most sports due to its focus on self-officiating. Flying Disc was introduced in Malaysia since the early 2000s in the form of Ultimate Frisbee by a group of expatriate teachers from an international school. Since then, the sport has grown tremendously 3,500 active players playing the sport. There are at least 20 tournaments are hosted annually in the country with more than 50 teams participating. Malaysia Flying Disc Association (“MFDA”) is registered under Section 17 of the Sports Development Act (1997) and is recognised by the Sports Commissioner Office, Ministry of Youth and Sports as the national governing body of flying disc sports in Malaysia. MFDA is also a full member of the World Flying Disc Federation (WFDF), which is the international governing body for flying disc sports recognized by the International Olympic Committee (IOC) and the International World Games Association (IWGA). As of March 2019, MFDA has more than 1,300 registered members and is actively promoting the development of flying disc sports in the country, including coordinating national team representations at international competitions. Since 2007, the Asia Oceanic Ultimate & Guts Championships (“AOUGC”) is a regional tournament organised by the World Flying Disc Federation every 4 years. The tournament is open to national teams from the Asia Oceanic region only, with 26 teams from 11 countries participating this year. We also accept contributions in kind such as training equipment or field space for training. You can also help us spread the word and help us achieve our goals of representing Malaysia at the 2019 Asia Oceanic Ultimate & Guts Championship. You can get your jersey signed by your favourite player and have a photo taken with the player. You will receive a signed "Disc is Malaysiaku" Discraft disc by all players from all 3 National Teams.